October 23, 2006 - Irvine, California - HireRight today announced that it ranked number 169 on Deloitte’s 2006 Technology Fast 500, a ranking of the 500 fastest growing technology, media, telecommunications and life sciences companies in North America. Rankings are based on percentage revenue growth over five years, from 2001-2005. HireRight grew 1,034 percent during this period. In addition to ranking on Deloitte’s Technology Fast 500, HireRight ranked 7th on the 2006 Technology Fast 50, which is a regional ranking of the 50 fastest growing technology firms based in Orange County, CA. August 28, 2006 - New York, New York - Inc. magazine has announced its 25th annual Inc. 500 ranking of the fastest-growing private companies in the country and has ranked HireRight, a leader in on-demand employment screening solutions, No. 427 on the list, with a three-year growth rate of 343.6 percent. This year’s list is the first to include businesses that started up immediately before and after September 11, 2001 – including the No. 1 company and 20 companies in the top 50 – as well as many companies that had to raise capital after the dot-com bubble burst. In total, 104 companies listed on this year’s Inc. 500 were started after 2000. In the headlines recently is the sordid story of an alarm installation gone bad. The case is set in Riverhead, N.Y., just south of the Long Island Sound. It began with a high-end residential install that featured motion detectors and a home CCTV system that featured tiny, hidden cameras. The job was performed by a local firm, Safeguard Alarm Co., and installed by Daniel Pelosi, who is now accused of murdering the multimillionaire banker whose home he had recently "secured." More twisted than that, Pelosi then wed the widow of the murdered banker. While Pelosi hasn't been convicted yet -- he is currently on trial, it underscores the value of knowing who your employees are. SecurityInfoWatch.com shared this story with Louise Urbanek, vice president of human resources for Pittsburgh-based Vector Security, which provides services for both residential and commercial security. We recently spoke with Urbanek to get her thoughts on employee background screening. From what she tells us, you'd be foolish not to do extensive checks on all your employees. Pre-employment screening has become a fast-growing multibillion-dollar industry. But beware: The process could cause more headaches than it relieves. Employers are worrying a lot about the possibly checkered pasts of employees and prospective new hires. As a result, the background-screening business is thriving. "Employment screening is the front line of defense, your first and best opportunity to eliminate candidates who are dangerous, dishonest or have a history of poor work performance," boasts one large screening firm in a pitch to employers. But the boom in screening services could be another reason in itself for employers to lose sleep: Heavy and insufficiently critical reliance on these sleuths could trigger different headaches and legal problems, experts warn. The forces fueling the growth of screening services are clear and compelling: the advent of "negligent-hiring" and "negligent-retention" litigation following workplace violence incidents, post-9/11 terrorism jitters, new legal mandates for background checks for employees in certain sensitive positions and industries (e.g., health care and transportation), a wide recognition that many prospective hires will brazenly lie about their employment history and employers' own self-defeating refusal to share meaningful reference information on past employees. The advice to HR in all this, then, would be to pick your screening companies wisely and be sure to keep an eye on them along the way. Shoplifters and dishonest employees continue to steal in record numbers from U.S. retailers. The recently completed 18th Annual Retail Theft Survey, which covers 24 major retail companies, representing 13,313 stores, with retail sales exceeding $519 billion (2005), reports thieves stole over $5.8 billion from these retailers in 2005. Even though the survey participants practice true loss prevention strategies, this group of retailers still apprehended over 670,000 shoplifters and dishonest employees in 2005, and recovered more than $127 million from those apprehensions, a 17.3% increase over their 2004 recovery dollars. The recovery dollars were amazing this year, as recoveries from both shoplifters and dishonest employees were up over 16% each from 2004 (16.85% and 17.87% respectively). The dollar recoveries (per case) are staggering as well, with an average shoplifting case value of $126.87 (up 21.5% over 2004), and an average dishonest employee case value of $724.15 (an increase of 5.72% over 2004). Are You Ready to Extend Your Product & Service Reach by adding a Highly Profitable Drug Testing Business to Your Portfolio? Established Drug Testing firms with excellent industry reputation that have been in the business for over 10 years are now available. These highly profitable operations include a customer base with firms like Coca Cola, Anheuser-Busch and locations are available on west coast, east coast as well as in southeast and Alaska. Contact Ken Will, AdMed Consulting Inc., 3821 Signal St., Bismarck, ND 58504, 701-258-7127, kenwill@btinet.net for more information and/or to open a dialogue regarding this exciting opportunity. Do you transact business on the Internet? Do you share customer information with other companies? Do you engage in direct mail marketing or telemarketing? Are you storing customer information for any period of time?If you answered “yes” to any of these questions, your small business is in serious need of a data security and privacy plan. While public data breach notifications in 2005 reached into tens of millions of accounts annual identify fraud only increased four percent. The large number of data breaches and the publicity they have received has created the misperception that fraud resulting from data breaches is prevalent. Javeline data indicates, however, that only six percent of all known identity fraud is generated from data breaches. The percentage of consumers who go on to suffer a fraud as a result of a data breach is only 0.8%, or eight out of every 1,000. Strict automatic data breach notification laws ‘regardless of risk” to the victim will saddle businesses with costly and unwarranted requirements, while providing little protective value of consumers. A global third-party study commissioned by Cisco Systems recently revealed that while most remote workers say they are aware of security issues, their behavior -- which includes sharing work computers with non-employees, opening unknown emails, and hijacking neighbors' wireless networks -- suggests otherwise. Designed to better understand how teleworkers' perceptions and behavior heighten security risks for the global network community, information technology organizations and the businesses they support, the study revealed responses from more than 1,000 teleworkers in 10 countries. Conducted this summer by an independent market research firm, the study consisted of end-user surveys involving at least 100 respondents in each of the following countries: the United States, United Kingdom, France, Germany, Italy, Japan, China, India, Australia, and Brazil. It spotlights the challenge that behavioral and cultural tendencies create for IT security teams as more employees work outside of traditional offices -- a business practice that can enhance productivity yet jeopardize corporate and personal security. U.S. employers expect to close out 2006 the same way it began - with steady hiring plans - according to the seasonally adjusted results of the latest Manpower Employment Outlook Survey, conducted quarterly by Manpower Inc. "Eleven quarters of consistent survey results show that the job market in the U.S. is not prone to radical swings at this stage. Even the economic pressures of 2006, such as rising interest rates, energy costs and inflation, were not enough to rattle employer confidence. Employers are also experiencing difficulty in finding skilled people, which is contributing to the moderate hiring plans," said Jeffrey A. Joerres, Chairman & CEO of Manpower Inc. Of the 14,000 U.S. employers surveyed, 28% expect to add to their payrolls during the fourth quarter of 2006, while 8% expect to reduce staff levels. Fifty-eight percent expect no change in the hiring pace, while 6% are undecided about their hiring plans for September - December. Hiring activity in seven of the 10 industry sectors surveyed is expected to remain relatively consistent with third quarter projections, according to seasonally adjusted data. Those sectors include Construction, Durable and Non-Durable Goods Manufacturing, Transportation/Public Utilities, Wholesale/Retail Trade, Services and Public Administration. One of the true test of any association or organization is the added value it gives to its members. In today’s fast pace environment busy professionals have to make choices about how to spend their time and which organizations they want to be associated with. The following is one person’s experience that clearly demonstrates the value that NAPBS has contributed to her. The networking with the vendors and other background screening businesses has helped my business grow and provide better resources for me. The NAPBS provides us with a voice in Washington and I enjoy the networking with my peers. Remember we can help you create a webzine to send to your clients and/or prospects that will uniquely reflect your company’s brand and image by creating a private label version of The Background Buzz just for your. Contact Barry Nixon at wbnixon@aol.com or at 949-770-5264 to discuss how we meet your marketing needs. This article examines the interest by federal policymakers to tackle the problem of identity theft by restricting the display of Social Security numbers in public documents. Social Security numbers are replete in court records such as probate files, land records, divorce documents, and other family-related court documents. Recent incidents in which Americans’ confidential information has been compromised are making Congress take another serious look at legislation to prevent identity theft. In 2006 a staff person at the Department of Veteran Affairs staff reported that his laptop, which held confidential data for about 26 million veterans, had been stolen. In 2005 ChoicePoint, a Georgia-based information broker, revealed that personal information of more than 100,000 customers in all 50 states had been compromised. Again in 2005, Bank of America said that it had lost tapes containing the records of 1.2 million federal employees. Congress will likely use the above incidents to push longstanding legislation to restrict the display of Social Security numbers (SSNs) on public records, including those found in court documents. A surge of identity-theft cases has added fuel to the growing fear of misuse of personal information. According to a Javelin Strategy and Research survey, in 2005 there were nearly nine million identity theft victims with estimated losses totaling almost $57 billion. Everybody is aware of California’s security breach notification legislation, however, there are 31 states that have some form of security breach laws on the books. Click on the link below to see a comprehensive listing of the state laws for security breaches. United Kingdom - New laws on corporate manslaughter are introduced. They will create a new offence of corporate manslaughter, which would allow organisations to be prosecuted for management failures that lead to the deaths of employees and others. The new offence would apply when an individual has been killed because the senior management of an organisation has grossly failed to take reasonable care for the safety of employees or others. It would be an offence committed by organisations rather than individuals and would therefore carry a penalty of an unlimited fine rather than a custodial sentence. The Bill can be viewed on the Parliament website. Online job recruitment activity and related employment opportunities across the United Kingdom dipped in September, according to the Monster Employment Index UK, which despite edging downward remained near its highest level on record set in August. The Index dropped three points to 125 last month, driven by a drop in online job offers for workers across a number of industry sectors including education, training and library; hospitality and tourism; and sales. Despite the slight dip in September, a number of sectors showed growth including healthcare, social work and personal care; and accounting, audit and taxes. Year-on-year growth of the Index now stands at 25 points, or 25 percent. All UK regions showed reduced online recruitment activity of various degrees, with Wales and the South West exhibiting the strongest drop. Meanwhile, online offers in London and the South East remained relatively stable in September. It is challenging to verify the credentials and background of job applicants within a single country. How might enterprises reasonably manage this challenge globally? How might employers protect themselves against fraud and criminal conduct without running afoul of an increasingly complex web of data privacy protections in Europe, North America, and beyond? International labor mobility and global sourcing strategies (outsourcing, offshoring) are factors that have brought attention to the need for background check and credential verification approaches that work internationally. High-profile cases of CV fraud also have focused attention on the problem. For example, a presidential appointee at NASA, the CFO of Veritas (ironically meaning truth), the CEO of Radio Shack, the Chairman and Chief Executive of Bausch & Lomb, the communications director for Manchester United, a hospital chief within the UK’s national health system, a Hong Kong Tycoon and chairman of an Asian telecom giant, and the chief of an oversight office within South Africa’s military. Australia - Access Management Consultants senior recruitment consultant Jenny Eager says her research has shown only 59 per cent of human resource managers verify the authenticity of candidate qualifications, only 78 per cent verify employment experience and less than 50 per cent check a candidate's criminal history. So if everybody knows that resumes are more sales pitch than an accurate account, why aren't employers conducting thorough background checks to ensure they aren't being lead up the garden path? Ms Eager says time constraints are the main reason background checks are not carried out on potential staff. "There is no doubt that verifying a person's history is a lengthly process and often employers just don't have the time," Ms Eager says. "People also like to trust their own judgment. Employers feel if there was something suspicious about the applicant, they would have sensed it." But Ms Eager says just because someone is friendly and likeable does not mean they are honest and trustworthy. She warns that the costs of replacing a dishonest employee once they are hired are significant -- sometimes up to 200 per cent of the person's salary. The recruiting of staff is the greatest challenge that HR practitioners in China face. But turn the turtle on its back and we see that recruiting is big business. There is a lot going on underneath. A mulititude of players offer everything from executive search to Applicant Tracking Systems (ATS).The graphs (go to http://www.the1.com/ to view graphs) tell an interesting story. They are based on a large scale study of international companies who offer some form of solution for recruiting. They illustrate well how the investments in the recruiting space have shifted from Hong Kong to Mainland China, and specifically to Shanghai. China is taking off, with Hong Kong flat. The study was done by a London-based MandA specialist called The1, and if you want to know more go here and click on ’Research’. National Institute for Prevention of Workplace Violence, Inc.
With ‘Continuous Employee Screening’ tools now becoming available we believe this will be an invaluable tool to assist firms to better manager their risk by knowing important information about their employees and will also help to prevent negligent retention. This tool will help firms to be able to identify whether mandatory licenses or professional certifications are current as well as derogatory issues such as DUI’s, criminal warrants, convictions, etc. that could have an impact on an employee continuing to qualify for their position or a proposed one. Since overwhelming employers use outsourced background screening firms to conduct their background checks, we have decided to primarily offer this consulting service through background screening firms. This will be a value added service that you can offer to your clients when you are selling them your ‘continuous screening’ tool. We have developed a proprietary implementation process for assisting firms with continuous screening that you can offer to your clients. Contact Barry Nixon at 949-770-5264 or online at wbnixon@aol.com for more information. This was another great ASIS International Annual Conference and Expo. There were 34,000 attendees reported. While the exhibits at ASIS International are more hardware than services, the employment screening industry was again well represented, with 18 Retail Background Screening companies, 4 companies offering databases (criminal, address and other), one drug testing, one pre employment assessments company and one missing in action. This year more than before, the portion of companies with CEOs/owners in attendance seemed to be higher. The trade show is, of course, about interacting with existing clients and meeting prospects, but it is also very much about interacting with the other exhibitors to do a little corporate intelligence and to share information and talk about industry problems. Be sure to read the full article and get Bruce’s insights on each company that was in attendance along with new products coverage. October 4, 2006 - Irvine, California – HireRight, Inc, a Platinum Member of PreemploymentDirectory.com, the leader in on-demand employment screening solutions, today announced that the company’s recently released Extended Workforce Screening (EWS) Solution has been named one of the Top HR Products of the Year by Human Resource Executive (HRE) Magazine. Selected from a record number of entries, the HireRight Extended Workforce Screening Solution was chosen after thorough evaluation by the HRE editorial staff. The HireRight Extended Workforce Screening Solution is the first available software solution for managing the background screening of vendor and partner employees, temporary employees and independent contractors who have access to a company’s facilities, data, personnel and information systems. LONDON, September 13th, 2006. World-Check, the leading provider of risk-related intelligence on heightened risk individuals and entities, is proud of its record of being ahead of the sanction-list curve. During the last 18 months, the U.S. Treasury’s Office of Foreign Assets Control (OFAC) augmented the OFAC List with some 330 individuals and entities. Through its continued research and expertise, World-Check had identified 89 of these prior to their inclusion on OFAC. Of even further note, 21 of these 89 are in relation to terrorism. Once again World-Check has proven its worth as an early-warning system in protecting the financial community from adverse risk. Over 2,000 institutions, including 45 of the world’s 50 largest financial institutions and hundreds of government agencies, rely on the World-Check database of known heightened-risk individuals and businesses to efficiently screen their customers, associates, transactions and employees for potential risk. World-Check’s database, compiled entirely from open source information, often identifies individuals as heightened- risk before they appear on the lists of sanctioning organizations, such as the Bank of England and OFAC. An example is the case of Radulan Sahiron, a leader of the terrorist organization Abu Sayyaf Group (ASG). Sahiron was, profiled on World-Check in August 2002, more than three years ahead of OFAC adding him to its list of Special Designated Terrorists in November 2005. World-Check not only profiled Sahiron, but also identified and linked a number of other senior members of the same terror group, notably Isnilon Hapilon and Hamsiraji Sali. Several of these individuals are still not listed in OFAC. The university medical center is made up of five hospitals, a college of medicine and public health, two research institutes, and a network of more than 30 medical facilities throughout its home state. Its largest hospital contains approximately 1,000 beds. The medical center’s three main hospitals alone total more than 2,000 doctors and residents. The medical credentialing department at the medical center is responsible for verifying the records and checking the backgrounds of every one of those doctors. That department is also charged with maintaining medical school alumni records and the credentialing documents and official files of all the doctors previously employed at one of the three hospitals. Considering that public health is one of the most important concerns in our society, these records are very extensive and can be quite a lot to manage properly. The systems administrator for corporate credentialing at the medical center is part of the team accountable for the proper maintenance of doctors’ records and the credentialing process. In the summer of 2004, she began looking for an imaging system that would enable her department to manage their multitude of doctors’ records electronically. Her initial search was for an electronic document management system (EDMS) that could integrate with their existing software applications and eliminate a lot of their hard-copy files. After preliminary discussions with a locally based EDMS provider, she began working with another department within the university that had experience with EDMS and Optical Image Technology, Inc.’s DocFinity® software suite. Together, they discovered that DocFinity could assist the medical center’s credentialing department in ways far beyond imaging. Getting Ready for Selling Your Company. 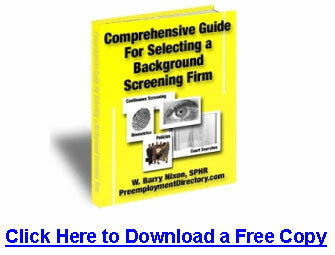 Get a free Comprehensive Guide for Selecting a Background Screening Firm – Everything you need to know to select a firm that will help you to avoid bad hires. Learn about industry best practices and standards.